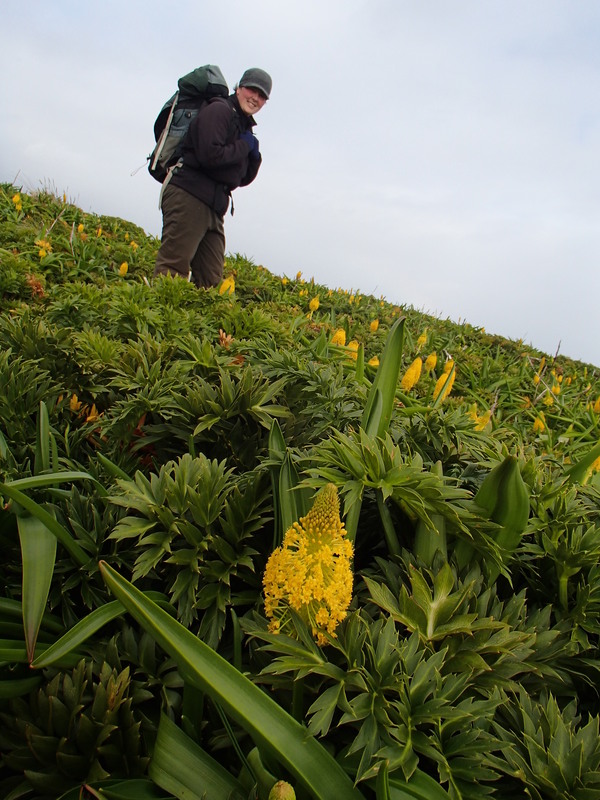 When I last blogged the 2012 Auckland Island expedition was getting ready for its final yellow-eyed penguin count on Enderby Island, and we were hoping for big things – or at the very least big numbers of penguins. 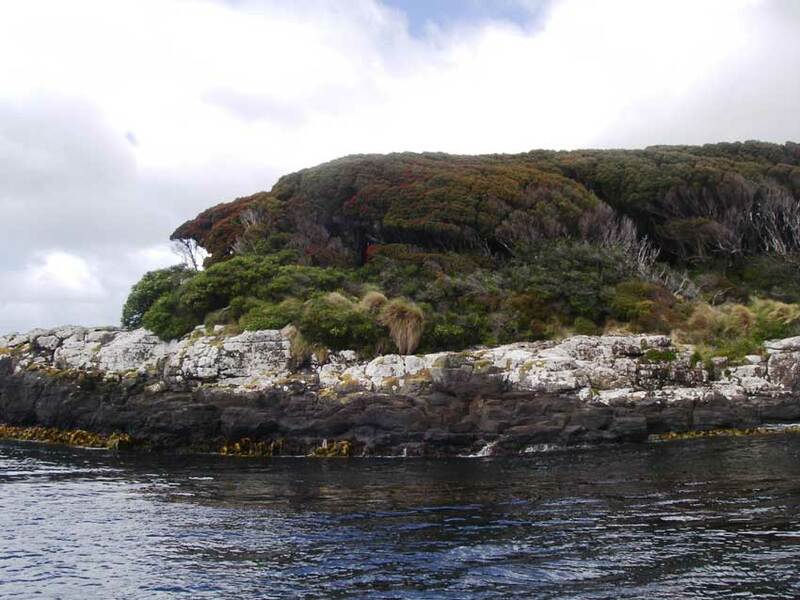 Enderby Island is ‘the’ hotspot for yellow-eyed penguins in the Auckland islands – back in 1989, when he counted over 600 birds, Peter Moore calculated that it was home to a third of the island group’s penguins. We had a plan of action that would see us out of bed at 2.30 am and getting dropped ashore by inflatable dinghy by 3.30 am so that we could make our way – in the dark – to our counting sites, some of which were nearly an hour and half’s walk from the landing site in Sandy Bay. And as Enderby Island is also a hotspot for New Zealand sealions, we were all hoping that we wouldn’t encounter too many of those on the way! 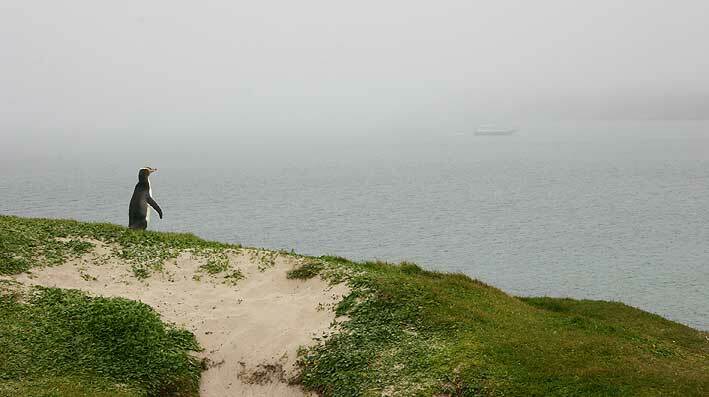 By this stage of the expedition we had visited both Port Ross and Carnley Harbour and begun to get a good sense of the islands and their history as well as their wonderful wildlife and beautiful megaherbs, which are just starting to flower. There had been some exciting afternoon opportunities to visit some of the historic sites associated with the failed Hardwicke settlement and the many shipwrecks. And one memorable day, while most of the team took a much-enjoyed visit to the white-capped albatross colony at South-west Cape on Auckland Island, Jo Hiscock and I headed across to the south side of predator-free Adams Island to band some young Gibson’s wandering albatrosses. These birds have been the focus of a long-running study by Kath Walker and Graeme Elliott, who are concerned at the decline in fledging success each year and the disappearance of adult birds. It was a special privilege to get so close to the huge albatross chicks, which at nine months old are still patchily covered in soft white down, but which are already the size of their parents and well on the way to growing their adult feathers. I enjoyed the way each chick greeted our arrival with a percussion blast of bill clapping, and was very thankful that none of them chose to vomit oily fish over me (so my yellow PVC coat and trousers came home clean after all!). But it was very poignant to walk around the colony and find nest after empty nest which had already failed. Out of more than a hundred eggs laid in the study area earlier this year, only 40% or so still have a chick, and it is likely that more of these will die in the next few weeks before they are old enough to fly away. The New Zealand sealions on Enderby Island, which have also been the focus of a long-term research project, have also seen a significant population decline over the last decade. For both species the causes of mortality include interactions with fisheries as well as possible changes in food supply related to changing sea temperatures and currents, while the sealion population has also been affected by several disease outbreaks. 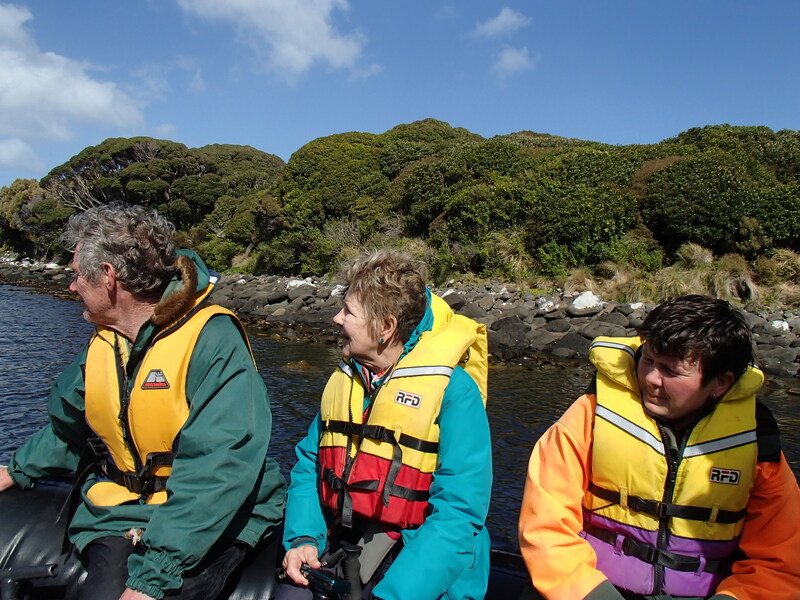 These stories highlight the fact that being isolated in the subantarctic is no guarantee of a safe future, which brings us back to the reason for our yellow-eyed penguin counting trip – to get a good estimate of their numbers now so that in future we’ll be able to tell if their population is increasing or decreasing. 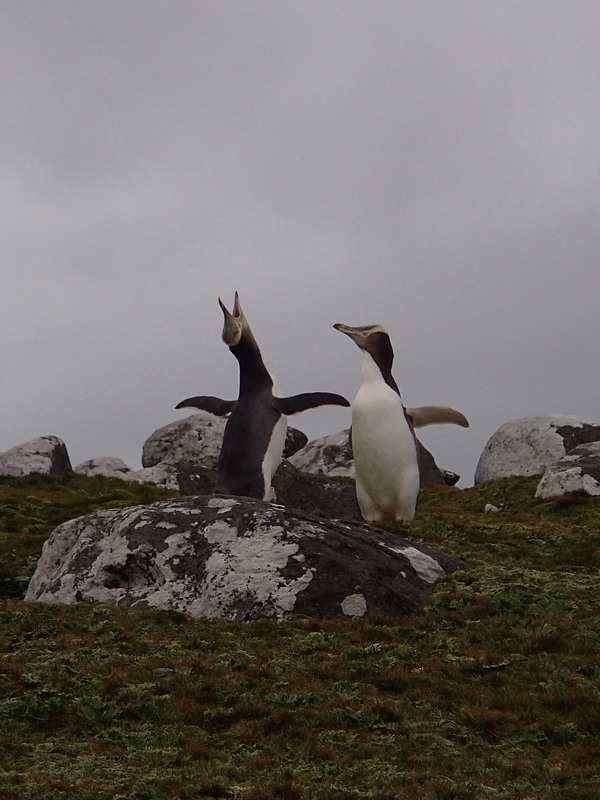 Our Enderby Island yellow-eyed penguin count was certainly the highlight in terms of numbers of birds counted. Jo had the ‘landing of choice’ and clocked more than 70 birds heading out to sea. I was treated to a close-up and personal visit by some very curious penguins that couldn’t work out what this ‘thing’ on the edge of the cliff was, and Al was entertained by a penguin that got itself bluffed at the edge of an Auckland Island shag colony and took the only honourable option – a 3-metre leap into the waves below. 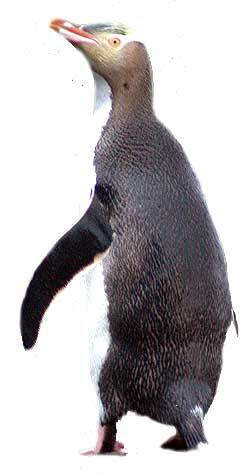 But despite our one-day best we counted just two-thirds the number of yellow-eyed penguins that were counted on Enderby in 1989, and for the trip as a whole the figure was the same – 2012 penguin numbers were two-thirds those of 1989. These however are just the first crude results, and Jo still has to sit down for a more thorough analysis comparing search effort and many other variables. In the meantime we can rest easily knowing that the 2012 Auckland Island Expedition was a success in every other way – we achieved all the penguin counts in all the sites that we wanted to survey, helped greatly by fine weather, smooth seas and a superb team of energetic and enthusiastic volunteers, who threw themselves whole-heartedly into their first subantarctic experience. Last week I blogged about the penguin flotilla heading down to Campbell Island and the Auckland islands to carry out a survey of yellow-eyed penguins. 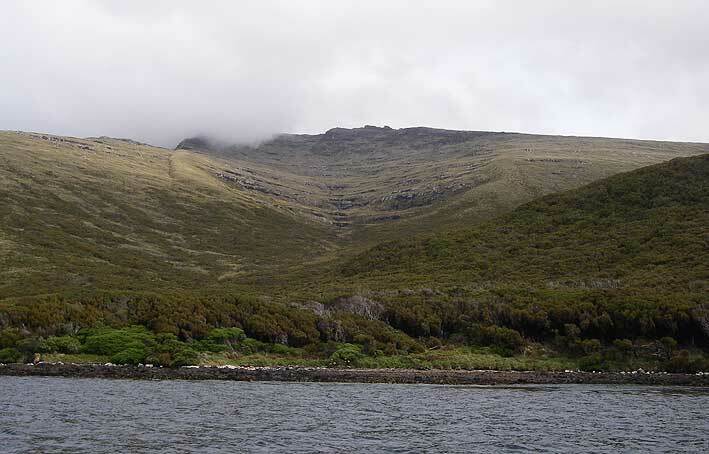 This blog comes to you from aboard the yacht Evohe, at anchor off Enderby Island at the northern end of the Auckland islands. 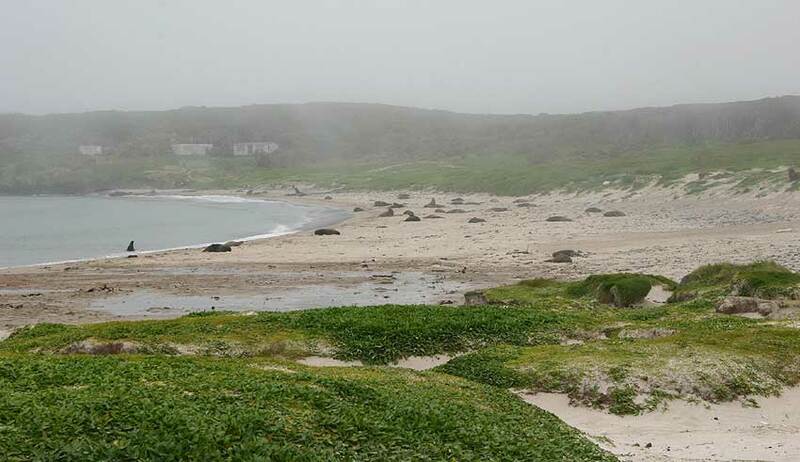 We’ve just completed our fifth yellow-eyed penguin beach count, and we still have one to carry out tomorrow. Team leader Jo Hiscock, along with Department of Conservation colleagues Dave Agnew and Megan Willans are currently in the inflatable dinghy with Mate Murray Watson, cruising the shore of Enderby Island to identify counting sites for tomorrow morning. We are expecting this to be our biggest count to date, as 23 years ago Peter Moore counted nearly 600 yellow-eyed penguins at sites around the island’s southern and eastern coasts. We feel as if we’ve achieved 10 days work in five, as we have very early morning starts, and are cramming two days worth of activity into each day. Jo’s alarm goes off at 3.30 am, and everyone is up and ready to go ashore by 4.30 am, although on a couple of mornings the Evohe crew were up at about 2 am, moving us from our safe, calm anchoring spot to get us in position so that we only needed a short dinghy ride. As it is still pitch-dark we are navigating by spot-light to find the handy pieces of reflector tape that the scouting team have put in place to mark our landing spots, and then we each scramble ashore to our designated watching spot. We officially count from 5-9 am, but I have to say it is still pretty dim at 5.30 am, which makes it hard to identify if the penguins we see are adults or juveniles. By 5.45 am, however, it is all go. We have been incredibly lucky with the weather, especially given the reputation of the Furious Fifties as being cold, wet and very windy. A smooth sailing down here has been followed by day after day of mostly calm overcast weather, with intermittent rain showers and even occasional outbreaks of blue sky and sunshine (although I have to admit there has just been a shout of ‘hail’ from the cockpit). Temperatures are certainly low, and by the end of four hours of sitting we are all chilled and wanting to move and stretch. But despite the discomfort everyone is having a great time. The six volunteers report they are loving every moment of the trip, and there is a friendly rivalry as to who sees the most penguins each morning. The record so far is Katie’s 18 penguins on Ewing Island, although she has also had a few days with zero penguins. So far we’ve carried out beach surveys (and we’re talking rocky shore platforms and bluffs rather than gentle sandy beaches) on Ewing and Rose islands, which are small islands close to Enderby Island, in Matheson Bay and North Harbour on the northern coast of the main Auckland Island, in Waterfall Inlet on the main island’s south-east coast, and on the north shore of Adams Island. We are trying to survey the same sites that Peter Moore surveyed in 1989 so we can compare figures, and so far our counts have been generally lower, apart from Ewing Island where we counted exactly the same number of birds. We’ve got our fingers crossed that our final morning tomorrow will see us rushed off our feet counting penguins on Enderby, as we’d love to get as many birds as Peter. I’ll let you know later in the week what our final grand penguin tally has been, and tell you about our sideline work on albatrosses. O and before I sign off I do have to let you know that we are now basking in sunshine and the sky is almost entirely blue – one thing that is certain down here is that the weather here is very fickle! As well as counting yellow-eyed penguins the Campbell island team, led by Sandy King, will be using a specially trained rodent dog to make sure that the island is still rat-free, while another dog, this one trained to find birds, will be checking out the Campbell Island teal, to see how their numbers are doing since they were reintroduced a few years ago. Alister Robinson is a funds manager who lives and works in Sydney but was Dunedin-born and bred. He volunteers on conservation projects in Australia, and has been building up his fitness for the trip with a few weeks of volunteer work at the Orokonui Sanctuary near Dunedin. Singing on the sidewalk and sizzling sausages are just some of the fundraising efforts made by Tairua School students to help save our native species. 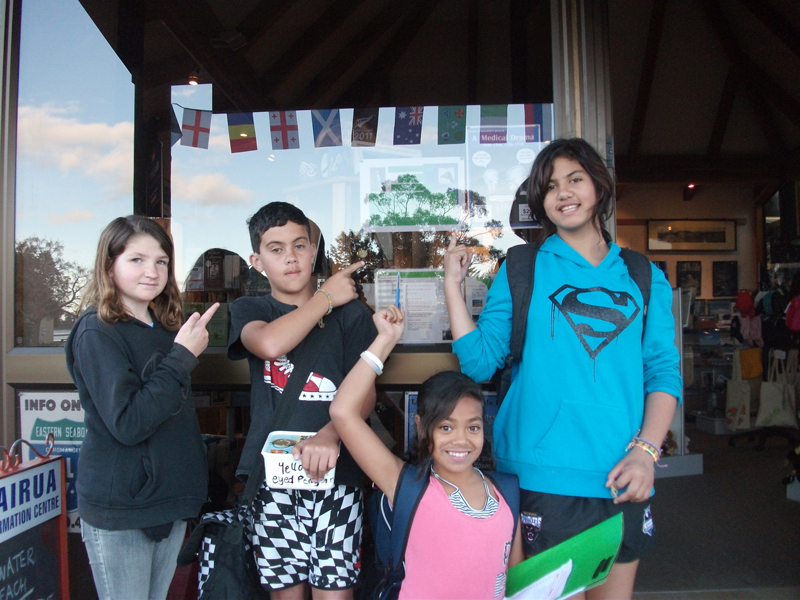 After learning about New Zealand’s biodiversity, Room 5 students wanted to make a difference; and that they did. All together they raised a grand total of $495! 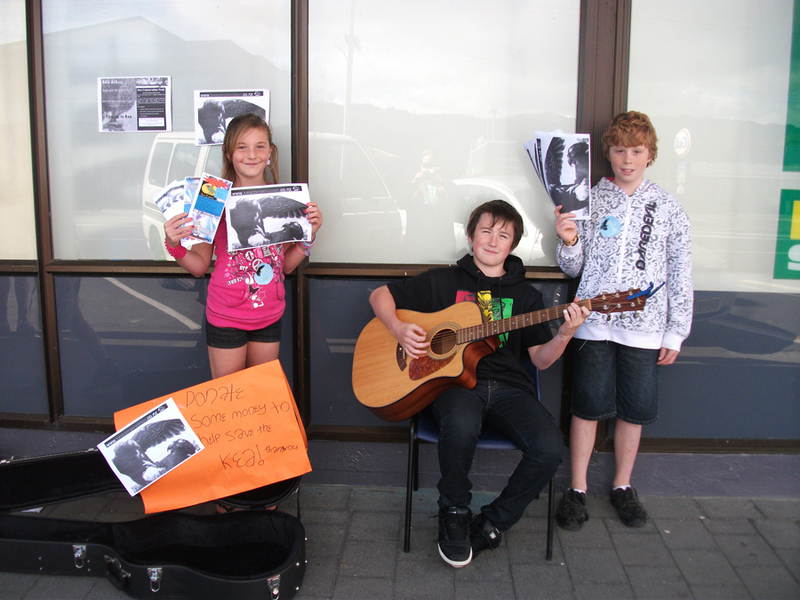 “We did good busking in the streets of Tairua, and we made $59.00 in just under an hour,” says Tim, who was in the Kea group. Kea, tuatara, kokako, kakapo and the yellow eyed penguin were the chosen species, all receiving a boost to their survival chances thanks to these budding young conservationists. “The tuatara’s a unique animal to New Zealand. It’s one of the dinosaurs that’s been here for a million years, and if we don’t save them… who will?” says Henry, whose group raised $270 for DOC’s tuatara recovery project. 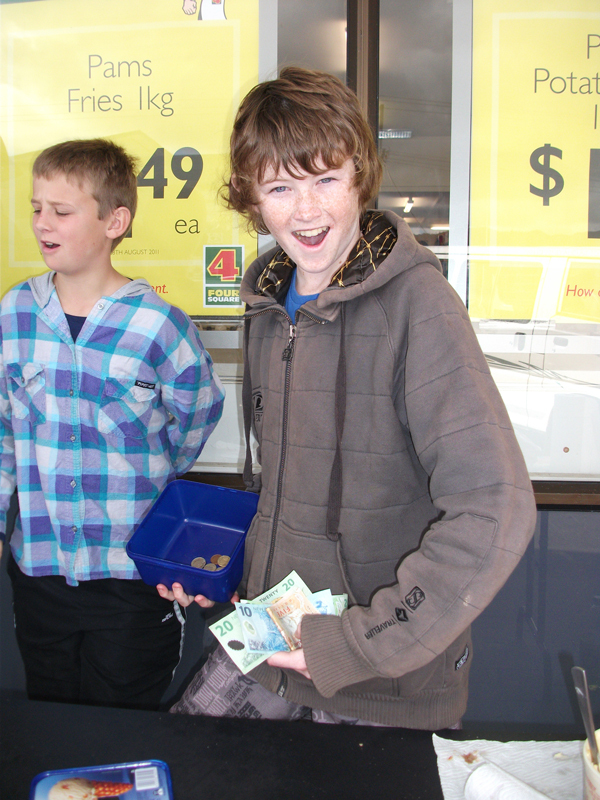 Children approached local businesses to ask for donations, organised a raffle with $50 worth of scratchies up for grabs, placed donation boxes in shops, sold good old fashioned sausages, and sang along to Tim’s guitar playing outside the local Four Square. They also put up posters around the community, promoted their cause on the radio, and advertised in the school newsletter. The students’ teacher, Samantha Telfar, says the students initiated their action plans to help save an endangered species of their choice. “I’m really pleased with the students’ progress and enthusiasm they are showing for their native species projects,” she says. Tairua locals are also big eaters, spending $73.80 on barbequed sausages, with funds helping out kokako. “The plan is to have a kokako in every back yard, and so many we can harvest them,” says Glenn Kilpatrick, helping out behind the barbie. The students presented their achievements to the class, including information on what they’d learnt, and what they’d do a second time around. 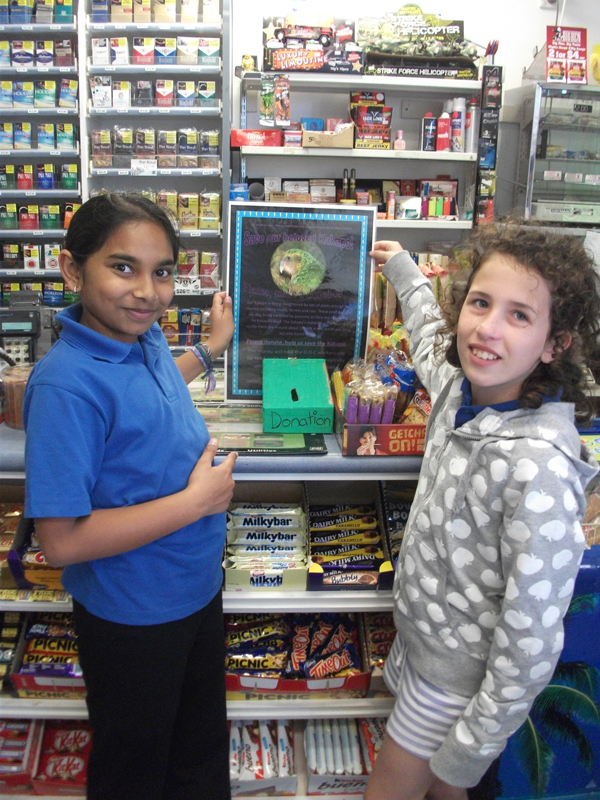 Each group was happy with the fantastic results they’d achieved for their chosen species, and wished to thank everyone who’d donated towards their cause.